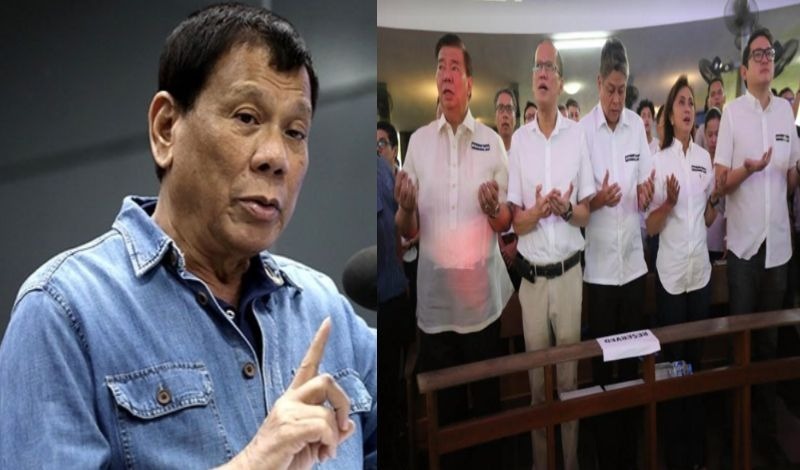 What President Rodrigo Duterte did was expose the fraud in the usage of virtues of the catholic church by politicians in order to gain the public's trust, according to Oscar Fernandez Picazo. The netizen's opinion was shared by the Facebook page Hidden Truth PH last Wednesday, entitled "THE FRAUDULENCE OF VIRTUE SIGNALING". Virtue signaling is the display of adherence to virtues of a community to gain the support or admiration of said community's members. "What President Duterte did is to expose the fraudulence of virtue signalling - the constant and visible praying over, the vigils, the washing of the feet, and other religious rites that the yellow personalities resort to in order to attract adherents." "This is the "Stupid God" that the President referred to, if you try to understand the wider context of his statement. Of course, the yellow media immediately spun the story out of context, for revenue or for political purposes," it added. Just recently, President Rodrigo Duterte has gone on a rift with the catholic church, raising issues such as pedophilia, abuse, and corruption among the church's leaders. The most infamous of his tirades is him calling the catholic church's God "stupid." Saying "Who is this stupid God? ", Mr Duterte criticised the Biblical story of creation and Adam and Eve being thrown out of the Garden of Eden after they ate the "forbidden fruit". "You created something perfect and then you think of an event that would tempt and destroy the quality of your work," he added. On Thursday, he said that he will not apologize for the remark. For Picazo, the remark only meant that Duterte was calling out the fraudulent traditition of virtue signaling,and called out the Liberals, Duterte's opposition, to stop the alleged use of such. "Kaya VP Leni (and other LP members), tama na yung mga religious rites na iyan. You are secular officials of a very secular country (we are not a theocracy, in case you have forgotten). Walang matinong tao na naniniwala diyan sa mga ritwal na ginagawa sa inyo. Wa epek nga eh. Virtue signaling does not work, not here, not anywhere," he said. He then spoke of the separation of the church from the state. "Of course, praying over, vigils, and washing of the feet are well-loved Christian rituals which ought to be respected by everyone, in their proper religious contexts of the Christian faith. The problem is the yellows' effort to spill these things over into our secular, political lives, blending politics and religion in comical semiotics. Lesson to be learned here: Let politics and religion be separate, as church and state should be separate."